Learning as a platform has been added to your bookmarks. Learning as a platform has been removed from your bookmarks. ​Say goodbye to standalone training programs. Corporate learning platforms that integrate development strategies, processes, and tools into your day-to-day business are where the real value lies. With the average tenure in a job being 4.5 years, and the half-life of a learned skill being only five years, linear career paths and functional silos are no longer sufficient to meet the needs of companies and workers in the digital age.1 In order to be effective, the modern work experience must deliver an integrated, always-on corporate learning and development experience. Rather than helping employees to progressively climb the ladder, it's about helping them to continually evolve and amass a "constellation" of capabilities and experiences. However, corporate learning departments have not traditionally been set up to provide the seamless, interactive, and iterative learning experience necessary to support an agile, digital organization and its rapidly evolving workforce. In our view, a new kind of corporate learning platform is required to deliver real employee and business value. 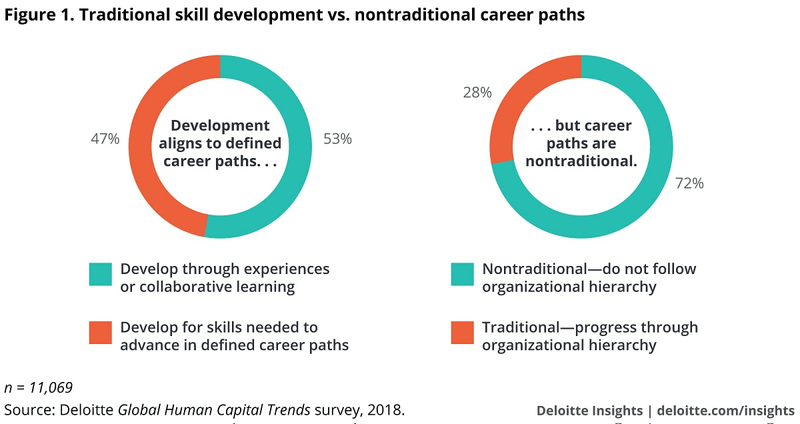 Though nearly three-quarters of respondents indicate that career paths in their organization are not based on a traditional organizational hierarchy, almost half still base their development program on the skills needed for these defined paths. The new corporate learning platform is much more than a technology platform—although technology can play a powerful enabling role. It's an ecosystem made up of strategies, processes, and tools that integrate so seamlessly into your business the learning function itself becomes invisible—not because it is less relevant but because it has become interwoven into the DNA of your organization. The ecosystem components are united in a common purpose: to connect people in near-real-time with the information they require to add value to the business and to expand and stretch their capabilities. Three dynamics are central to approaching learning as a platform rather than a stand-alone function: 1) developmental agility, 2) environmental enablement, and 3) informational empowerment. ​Developmental agility entails giving individuals, teams, and organizations the room they need to grow and produce desired business outcomes. It includes removing traditional barriers—such as functional silos, career paths, and finite job descriptions. It also involves enabling new perspectives from which people can envision innovative solutions to entrenched problems. The hallmarks of an agile development process include career experiences, agile teams and incubation, and organizational analytics and outcomes. ​While often not intended explicitly for corporate learning, enterprise technology systems not only underpin daily business activities, they are essential for embedding learning into every facet of the business and incorporating it into daily work. When learning is just a click or chat-box away, the need quickly fades for lengthy classroom trainings or tedious troubleshooting sessions. The hallmarks of environmental enablement include systemic learning and integrated technology. ​Thanks to the Internet, employees expect to have ready access to relevant information or to the people who can provide it, with minimal restrictions. An effective learning platform fulfills these expectations by supporting multidirectional information flow such as visibility into performance data, access to relevant content, and connections to colleagues and subject-matter experts. The hallmarks of informational empowerment include employee-driven initiatives, information flow, and feedback loops. Despite increasing workforce fluidity, there is an implied exchange of value that goes beyond the basics of salaries and job descriptions. Informational empowerment is the foundation of this two-way value proposition. Progressive organizations like ATB Financial are demonstrating the feasibility and value of the learning-as-a-platform philosophy. ATB Financial is a community-focused regional financial institution based in Alberta, Canada that employees approximately 5,300 people. As part of the company's strategy to become "a technology company that does exceptional banking," rather than a bank that simply uses technology, ATB developed a new learning strategy based on the idea of evolving the learning organization's role from creator to connector. ATB tested the concept in practice last year for a major digital technology deployment. "The objective was to unlock the potential of over 5,000 team members and empower them to reimagine the way they work," said Meriya Dyble, director of Learning Reimagined at ATB Financial. ATB accomplished this by forming cross-functional squads tasked with embedding learning into the DNA of the organization and leveraging the new company-wide digital platform to enable their efforts. "With this ecosystem, learning has become a way of connecting people, information, and ideas with business problems that need to be solved." said ATB's Dyble. In the age of knowledge capital, organizations that approach learning as a platform will increasingly have a competitive advantage, both in terms of improved business performance and better talent acquisition, development, engagement, and performance. 1 Douglas Thomas and John Seely Brown, "A New Culture of Learning: Cultivating the Imagination for a World of Constant Change," (CreateSpace, January 4, 2011), as featured in "Deloitte 2017 Human Capital Trends: Rewriting the rules for the digital age," https://www2.deloitte.com/us/en/pages/human-capital/articles/introduction-human-capital-trends.html.